~Kumamoto Oysters– great with lemon and hot sauce! 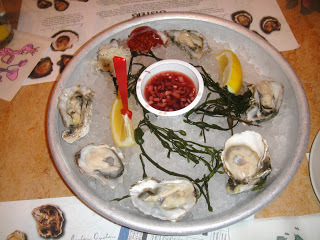 Not a big oyster eater, but these were tiny so I liked them lol. ~Wild Alaskan Red King Crab (1 lb)- side of Grilled Zucchini and Sweet Buttered Corn. Great crab. I felt like it wasn’t enough for the price, but it was really good. ~Lemon Nut Crusted Wild Californian Seabass- side of Cole Slaw and Mac N’ Cheese. Loved this. Great flavorful fish and the Mac N’ Cheese was perfect! *I also suggest their Clam Chowder & Southwest Salad with Blackened Chicken. One of my favorite salads! King’s Fish House is a fun place with a festive bar, and an outdoor patio you can sit at as well which is really nice in the summer. The restaurant is big, and they have a lobster tank where you can look at the live lobsters. For all you seafood lovers, King’s is one of the many good seafood restaurants out there. Previous PostSAN DIEGO BLENDERS- BRAZILIAN ACAI BOWLS!